Listed with most recent first. See also list with abstracts. Critical Focus No 30: Still Waiting for Cures After All These Years, The Microscope 65 (4): 159-169, 2017. Critical Focus No 22, Forensic Science, Peering down a Blind Alley The Microscope 63 (2): 77-88, 2015. Critical Focus No 21, The Incredible, Invisible world of Robert Hooke The Microscope 63 (1): 23-34, 2015. Critical Focus No 12: The Microscope and the Caveman, The Microscope 60 (4) 157-165, 2012. Critical Focus 8: Strange Paradox of Blood, The Microscope 59 (4): 165-173, 2011. 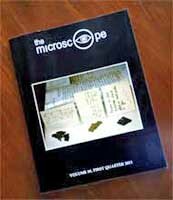 Critical Focus 5: The Story of the Leeuwenhoek Specimens, The Microscope 59 (1): 11-19, 2011.